290 years ago, the Royal decree was issued which went as follows: “There must be 39 priests kept on the Russian Fleet ships and other war vessels” – April, 1717. The first record of the priests serving on ships dates back to 1704. At that time Admiral Krüss issued the following document “Regulation for officers, sailors and other military men who should serve on seven galleys and hundred brigantines” where he complained of the poor recruitment of…priests: there has to be 10 priests while in reality only two are present”. In April, 1717, the Imperial decree was issued by the Russian Tsar: “There must be 39 priests kept on the Russian Fleet ships and other war vessels”. Apart from that, in the Naval Regulations of 1720 their duties and obligations were specified: they were to “properly conduct divine services”, pay visits to sick seamen and bring them consolation, “inform the captain of the conditions they are kept in” as well as “preach and read out scriptures”. That way, those who were to ease the seamen’ lot during peaceful days and share their fate during war days got accustomed to the romanticism of the sea and the ordeals of the naval service. The ship priests, like any other army priests, were supposed to keep the following two truths in mind: first, war determines the future fate of the country; second, the result of the battles depends on God’s will and joint efforts of the people. Bearing all these in mind, the ship priests would go to the crew’s quarters, cabins, mess-rooms, sick-bays and armoured decks. Being non-combatants, they were expected to incline the army for victory using the power of persuasion and providing the proper example of behavior. Generally, the priests were recruited to the fleet from the Alexander Nevskiy Lavra (monastery of the highest rank), though it was not uncommon for parish priests to carry God’s words to the seamen. The preference was given to widowers as, holding themselves as an example, they were not allowed to leave the ship they were assigned to frequently – they could go ashore nor more than once a week and only before dark. In the beginning of each fight, the ship priest should be at the dispensary station in order to help and confess those passing away. Known for Tsusima Battle, the priest of the cruiser Ryurik Andrey Konechnikov (Okonechnikov), apart from fulfilling his direct obligations, would gather and bring shells during battles. And later he, escaping from the Japanese captivity, delivered a dispatch on the weak areas and sectors of the enemy fleet and reasons of our defeat. 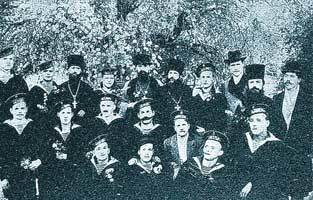 Another priest – Father Antoniy – on the 29th of October, 1914, as it becomes a true seaman, refused to leave the burning mine-layer Prut and died on that ship. His name, together with many other fleet priests, was carved on the gravestones, next to the names of other fallen seamen, in the Savior-on-Water temple which used to be situated in Saint-Petersburg. Many monks, who wore sailors’ striped vests under their cassocks, were decorated with various military awards like, foe example, Father Joannikiy I (Savinov) from the 45th fleet crew. 11 March, 1855, he joined the line and, by praying, instilled courage and fortitude into the wavering attack forces for which he was decorated with the Soldiers’ George Order of IV Class. By the way, as for preaching. Unlike those political-education lessons and political information work which were introduced later, sermons did not last for more than ten minutes, and the best of them were usually awarded with special bonuses and were published in the printed organs of the Army and Fleet priests – “The Bulletin of the Army and Fleet Clergy”. The first Army and Fleet ober-priest was Pavel Yakovlevich Ozertskovskiy, the last one - Georgiy Ivanovich Shavelskiy (his position was renamed into “proropresvitor”). In the military Table of Ranks this rank was equal to Lieutenant-General. Moreover, the senior army priest had the right to personally report to the Emperor. Nowadays, the wheel of history has brought representatives of the Fleet and Church closer once again. Their first meeting took place on a very mournful occasion. 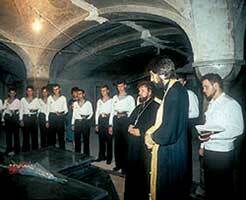 In 1990, in Leningrad Nikolo-Bogoyavlenskiy Cathedral, where in former times it was ordered to hold annual public services in commemoration of the triumphant victory gained by our Fleet near Chesma, a requiem for the seamen died on the atomic-powered submarine the Komsomolets was conducted. Apart from that, Archimandrite of the Saint-Petersburg Religious Academy Augustin (Nikitin) became the first ecclesiastic who was granted a sea pass and was taken on the ship staff. In the framework of his mission called “The Golden age”, Father Augustin took part in the expedition “Pilgrimage” organized by Petrozavodsk club “Polar Odysseus”. In the summer of 1990, three wooden boats built in accordance with the Old Russian models – “Vera”, “Nadezhda”, “Lyubov” (“Faith”, “Hope”, “Love”) – called at 15 ports of five Mediterranean countries. The pilgrims visited the Lord’s Grave affording themselves an opportunity to get acquainted with the cradle of the ancient Greek, ancient Roman cultures and Christian religion. During their voyage, all the travelers were christened by Father Augustin. Priests at the Russian Fleet. XXI Century. On the occasion of 1000-year anniversary of Russia’s Christening, Augustin undertook an ascent to the Elbrus summit, having become the first ecclesiastic to take part in such a risky enterprise. Though the day when the post of a ship priest will be introduced still seems to be a long way off, one should not forget that they have always served faithfully and loyally, first of all, Russia and the Fleet, much like those ships named after the monks “Oslyaby” and “Peresvet” which were built on the money raised by the Russian Orthodox Church as well.